Click to Ask Zach Your Question! but power is only available at night when the lights are on. Does this mean we will have to run additional power to the units?" The short answer to this would be no. We have two reliable alternatives to running additional power lines which are a bit more cost effective. 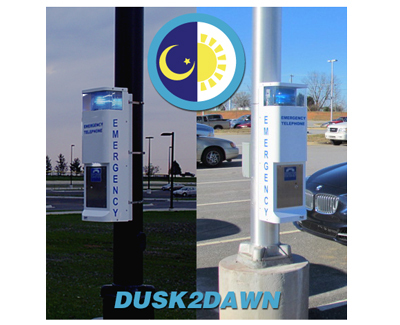 Dusk2Dawn units come with an additional 30 Ah battery that the Call Station operates on while the power from the light pole is absent during the day. At night when the lights turn on and the power becomes available, the Call Station utilizes that power to charge the 30 Ah battery for continued daytime use. and what are the best applications?" Answering this common question is best done using a large VA Hospital in the Midwest that leveraged this technology to achieve their desired solution. They wished to install our 9’ Emergency Tower Phones in their existing parking lots spread over the 100+ acre campus. Due to the amount of concrete and distance from the nearest buildings, it was impractical to run electricity or phone lines. The first decision was easy, and that was that the towers had to be solar powered because ripping up concrete wasn’t an option. The communication was narrowed down to two options, Cellular or 900 MHz. We knew Cellular would work, but they wanted to avoid having to pay cellular charges on the phones which would have been in excess of $6,000 per year. A site survey was the first step in determining whether 900 MHz was a viable option (two people are needed to do a site survey). 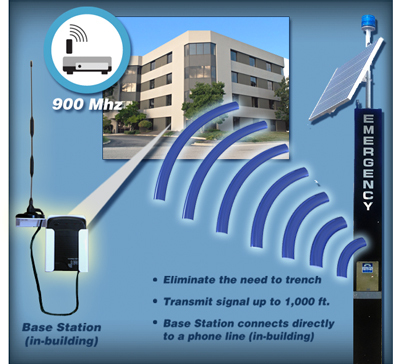 We used a portable testing device with one component at the location where the emergency phone would be located, and the second device within the building where the 900 MHz base unit would be connected to the existing phone system. They chose to “bury” the units in the ceiling, so the testing was done in the building near the outside wall facing the phone’s location. After successfully testing all the locations and having to relocate several initial desired locations, they had confirmation that they could achieve wireless technology with no ongoing costs. Trenching is not an option, or would be extremely expensive. You have a building within 1000 feet that has connections to your phone system. If you feel this is a viable option, contact us and we’ll send you a test kit to determine if it will work for your facility or grounds. There is not an industry standard for emergency phone placement. It is normally handled on a case by case basis because of the variability of environments, terrain, landscape, etc. That being said, we do have some “best practices” for placing emergency phones. A good rule of thumb is to have them placed within line of sight from each other so that you can see the next emergency phone from the one you are standing at. If this is not feasible because of man-made or natural obstructions, we recommend every 100 yards. 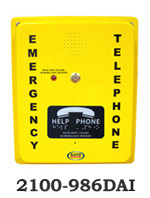 Our Yellow Call Box can accomplish that, but you would want to order a 2100-986DAI instead of the 2100-986DA. The 2100-986DAI comes with an additional relay to hook up to your door locking device. It is a function that can actually be programmed into the Call Box using the programming keypad. “Is there a requirement to have a phone in a walk-in vault? There are no known requirements involving communication standards for walk-in vaults, safes, freezers, etc. The IBC Code does have some accessibility standards, but nothing referring to communication. If you are installing an emergency phone in a walk-in vault, it should be ADA compliant. "We have 2100-CPL3 Call Stations installed in our parking lot. would like to connect the phones to use as a public announcement system. Is this feature available with our current RATH® model?" Our Mass Notification units are compatible with Omnilert, however, we are not able to retro-fit existing Call Stations with our Mass Notification speakers and housing. "Does your two-way option work with MotoTRBO digital radio systems?" We can integrate almost any radio with our blue light phones. There are some things to keep in mind, though. Two-Way Radio borderlines on ADA compliance seeing as it is not a “one touch” solution. It operates just like a typical walkie-talkie which is push to talk and release to listen. Also, depending on the level of security you need with the radios, programming can be very intensive and costly. Radio companies charge more for certain programming features or for the use of certain frequencies. Depending on how many you wish to install, our 900 MHz option may be a better fit for you. "How long does your Dusk2Dawn power option last without incoming power and what incoming power options are accepted? What kind of amp does it use? How many batteries are here?" Our Dusk2Dawn models last 3-4 days without incoming power. We can accommodate almost any incoming voltage but the most common ones we support are 120 vac, 277 vac, and 480 vac. There is (1) 30 Ah battery and (1) Lithium Ion battery for the phone board. "How does the phone service work? Is a POTS line required or are the phones wireless? Also, how are they monitored to make sure service is always available?" We can support many communication options. Our 9’ towers can communicate using Cellular, a POTS Line, VoIP, Wi-Fi, 900 MHz, and Two-Way Radio. Power can be solar or hardwired. Your best option depends on the existing infrastructure and what makes the most sense from a reliability and cost standpoint. Phone line monitoring depends on what form of communication you choose and is typically done at the head end with one of our software packages. required mounting height for the call boxes?" The ADA requires that the push button fall below 48 inches from the floor which is considered within reaching distance of a wheel chair. We recommend mounting 48 inches from the floor to the top of the call box.